Brighten any party table with our My Little Pony table decorating kit! 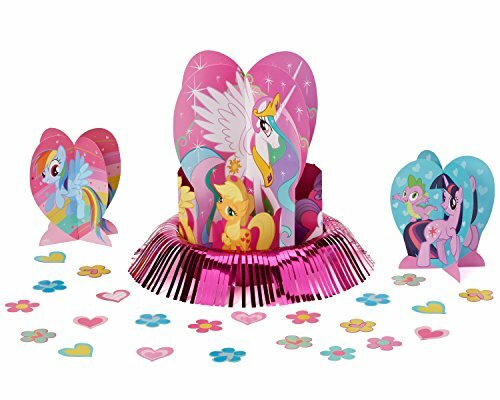 A large pop-out centerpiece design features favorite ponies Pinkie Pie and Princess Celestia, trimmed with shiny foil. Twilight Sparkle and Rainbow Dash leap out from two smaller centerpieces. Sprinkle the cardstock heart and flower confetti on the table for a magical touch! Table decorating kit includes one large centerpiece (12-3/4 in. ), two small centerpieces (7 in.) and 20 confetti pieces (2 in.). Makes the perfect addition to a My Little Pony-themed birthday celebration. Caution: This is not a toy. For decorative use only. Please keep away from children, flame, and direct heat sources. Please retain this information for future reference.